Our April issue of Intercom is out now. In our April issue we place a special focus on the right to life of the unborn. 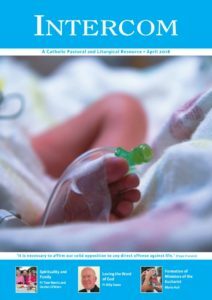 In this month’s issue, we welcome pro-life campaigner Cora Sherlock who writes on the legacy of the 1967 UK Abortion Act; Michael Dwyer returns to conclude his series on ‘Making the Pro-Life Case with Compassion and Clarity’ and we offer prayers and resources on the right to life. Also in our new issue, Salvador Ryan offers ‘an apologia for the popular prayer book’; Monsignor Colum Curry reflects on his recent sabbatical and David O’Hare writes on the impact of parish support on Trócaire’s work in the developing world. And as we look ahead to the World Meeting of Families in Dublin in August, Fr Tom Norris and Declan O’Brien write to us on the role of Spirituality in Marriage and the Family. All this and more along with our usual prayers, reflections and resources for the month of April. Click here to see the full contents page from our April issue. Our April Newsletter, Irish Mass and Prayer Resources will be available shortly. Resources for March are available here.